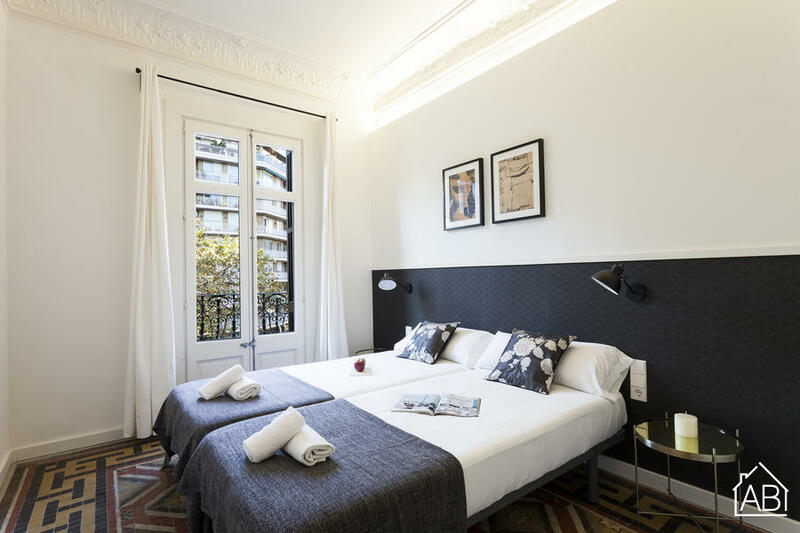 Just a short walk from Barcelona’s main square, Plaça Catalunya, based in the stylish Eixample neighbourhood, this 2 bedroom apartment offers an ideal location for those wanting to stay in the heart of the city. Eixample is a popular district for many, due to its central location, beautiful architecture and plethora of cafés, shops, restaurants and bars. This stylish apartment is modern throughout yet features much of the original flooring and ceiling details, whilst offering a comfortable and homely feel. There are 2 bedrooms each with 2 single beds, sleeping a maximum of 4 people. The apartment also boasts 2 modern bathrooms each fitted with a walk-in shower. Preparing a home-cooked meal in this trendy apartment is made easy in the fully equipped kitchen, which features an oven, microwave, toaster, kettle, blender and coffee machine. Enjoy your meals at the dining table before relaxing for the evening in the living room, which comes complete with a flat-screen television, comfortable sofa and armchair. The apartment also contains an iron, washing machine, dishwasher and a hairdryer for your convenience. With both air conditioning and central heating, this apartment offers a comfortable stay during all seasons.